Our expertise is the design and development of eye catching websites that will attract the search engines with the correct SEO content for your topic. We also offer a full corporate identity including business card design, brochure design and other media. Logo design, billboard design and general graphic design is an established part of our service. 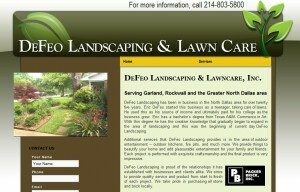 Garland Texas Landscaping & Lawncare by Defeo: Barry’s a rockstar! He and I have been friends for over 20 years and sometimes doing business with friends backfires. Not in this case! We did a complete redesign of www.defeolandscaping.com. He was always ready and willing to make whatever changes we wanted no matter how small. He was thorough in his explanation and his knowledge of all things web related is impressive. If you have are looking to launch a new site or re-launch an existing site, I implore you to call Barry. You won’t be sorry! 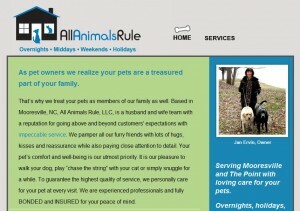 Helping a Moorestown, NC Pet Sitter with optimization on her website. After having my web site designed by someone else and go live for several months with Zero results, I heard about Barry and decided to give him a try. Best business decision I’ve made so far! He quickly and effectively worked his magic to get me placed consistently on the first page under several categories in Google searches. NOW I’m suddenly getting calls from new customers. All thanks to Barry! The fact that we live in different parts of the country and had to work long distance wasn’t a problem either. He was still very responsive and answered all my questions as if he were right around the corner. Thanks a million for a job well done!? Testimonial: Outstanding Service, Quick Turnout Around?Where should we start! We can’t say enough good things about Barry. We were novices to the world of web-design, and he walked us through it with ease. He captured the image we were trying to create immediately and custom built a design for us in days! As the website is for a judicial campaign (www.votelatchana.com), time was of the essence and Barry was up to the task. He is incredibly professional, knowledgeable and has a lot of tricks up his sleeve to make your website perform well; not to mention he’s just a good honest guy. We are thankful to be working with him and will be recommending him and his business highly! Thank you Barry! The Committee to Elect Mark W. Latchana 67th District Court Judge? I could not be happier with my new website. It is getting me instant results and will only get better. Barry was very responsive and easy to work with. I would recommend him to anyone. LaMenga Kafi, New York This provider is EXCELLENT!!! He showed much enthusiasm in the project and was patient and very talented!!! He took the project to another level for me in no time and I was VERY pleased. Very seldom do you find people that REALLY care about the work even after it’s done. Barry Pendley's service has always been excellent. He is prompt, always available, and knowledgeable. He has met all my computer needs solved any problems. Barry has been awesome taking our business to the next level! He designed our website and exceeded our expectations. He always responds in minutes to our calls. I highly recommend him and cannot thank him enough. We are busier than I ever thought we could be. I have used Barry's computer expertise for our corporation, our Grand Blanc outdoors club as well as personally. He is a very knowledgeable, talented and reliable individual with strong work ethics. I'm happy to say that we have been very pleased with his service, promptness, honesty, quality of results and fair pricing for the past 15 years and therefore I do highly recommend him. You will be pleased with him and Evmikna. I've hired Barry on multiple occasions to take some drone aerial photography for our landscape architecture firm. His work is always excellent, his rates are reasonable, and the added bonus is that he's a terrific guy who is great to work with in every way. I would recommend Barry without reservation! Barry created our first website many years ago and has been with us through all the updates, re-designs and upgrades that we have done! He is always quick to respond if we have questions or issues, and if there is ever a server or internet issue, he is extremely proactive in notifying us and keeping us updated. He gets our highest recommendation, and in fact, we've referred several others to him when they've been looking for a professional, responsive service that is honest and reliable. Evmikna is a company that can be trusted. When ever I need website help, Barry is always quick to respond with solutions! I highly recommend Evmikna to anyone looking for graphic designs and website services. Barry did an awesome job with our logo design and was very patient and receptive to my ideas. So pleased I am having him do our web page as well !